I have 2 Scouts, one already has a Level 21 Legendary weapon. I'm trying to decide which of these two to upgrade for my 2nd Scout. I feel like the 18-21 weapon has great traits for missions (reducing threat and chance of extra charge), but the 19-22 will obviously just be way stronger (coupled with the extra strength trait). Should I go more power or more useful traits?? What do people think?? I like the knife traits better. Faster charge gold on hammer is meh for the scout class. 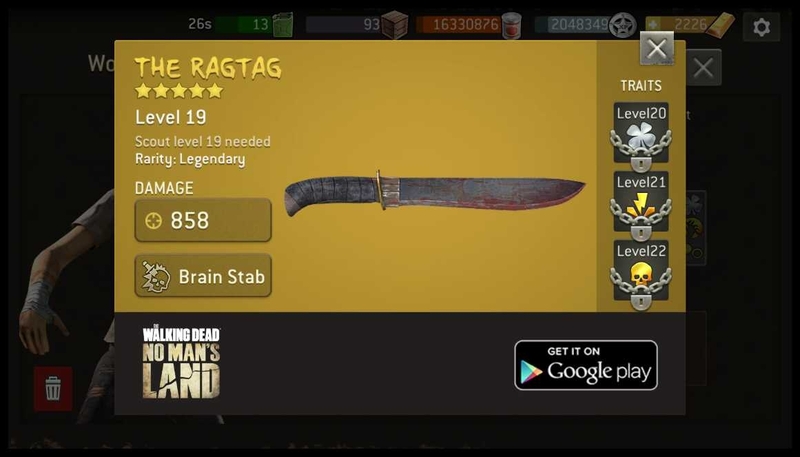 Brain stab just isn't that impressive. Both have silver luck. The knife has interrupt and with gold skull your scout will be hitting like a truck even without a crit. My ideal scout weapon is gold luck, gold swift strike and silver skull. Knife would be my preference, as I like Overwatch as a slow and steady team. Your team may be more aggressive and may get more use out of the hammer. So you'll have to see how it matches the rest of your team.